Sometimes a muzzle is needed as a tool or to prevent undesirable behaviour. This includes dogs that need to be examined by a veterinarian (to prevent them biting out of pain/fear) or dogs that do not get along well with other dogs on walks. What's more, the regulations abroad sometimes oblige you to muzzle your dog or require you to bring a muzzle with you. Various types of muzzles are available, including a nylon muzzle (nose strap) or a muzzle made of plastic, leather or metal. A nylon muzzle (Pawise nylon muzzle or Henry Schein nylon muzzle) is a strong strap around the mouth and another strap that is attached behind the ears. This can prevent the dog from biting. Do ensure that you get the right size, as the dog can still bite if the strap is too loose. This strap is suitable as a tool for an appointment at the vet's. Please note: As this muzzle ensures that the mouth is fully closed, your dog also can't pant with this nose band. This means that the product is NOT suitable for longer term use, use on hot days or on walks. There are also muzzles in the shape of a "cone" (Baskerville ultra muzzle or Buster Plastic Muzzle). This muzzle is put around the whole mouth and then also attached with a strap behind the ears. This muzzle might look a bit more "intense" than a nose strap, but it is more comfortable for the dog to wear. The dog can move its mouth as well as pant and drink with this muzzle. Moreover, when you fasten it correctly, there is no risk of the dog still being able to bite. Various types of muzzles are available, such as a plastic or leather muzzle. The plastic muzzle is easy to keep clean. It is important that the muzzle fits properly, so that it is not too tight but also not too loose, causing it to move. For short-snouted dogs (such as Pugs, English and French Bulldog), it is very difficult to find a muzzle that fits properly. Given the dog's anatomy, the muzzles will not stay in place, and because the bridge of the nose is very short, the muzzles can obstruct the eyes. Veterinarians sometimes use a linen strap. This strap is placed around the nose with a button on the bridge of the nose and then crossed under the mouth, and it can then be tied behind the ears. This is only suitable for short-term use. How can you teach your dog to wear a muzzle? If you suddenly put a muzzle on your dog, this can be an unpleasant and stressful/anxious experience. That is why it is important to introduce the muzzle gradually and teach your dog to wear it using positive association. Let your dog get acquainted with the muzzle first by showing it to him. Make sure you have plenty of treats or biscuits to hand. When your dog comes to sniff the muzzle, reward it with your voice or a treat. Then you wait until your dog puts part of its nose in the muzzle to reward it. The next step is to ensure that the dog puts its nose fully into the muzzle before it gets the reward. This can be done by putting the treat in the muzzle or by offering the treat through one of the openings at the front of the muzzle. When the dog puts its nose in the muzzle without hesitation, you can start trying to keep the muzzle around the nose for a number of seconds before giving the reward. You can keep putting it on a little longer. Once the dog tolerates that well, you can place the straps behind the ears and hold it for a few seconds this way. This allows the dog to get used to the feeling of the muzzle being attached. If the dog is good, reward it again with your voice and a treat. The next step is to attach the strap for a little while, reward the dog if it stays calm and then taking it off straight away. Then practice this step, keeping the strap fastened a little longer each time. Give a number of treats, one after the other. It is important to take the muzzle off before the dog starts to find it uncomfortable. Also try to prevent the dog from using its paws to try and take the muzzle off. If the dog gets through these exercises successfully, you can try to go for a little walk with your dog wearing the muzzle. Carry out this exercise at home first. If this goes well, you can take him for a little walk outside. If the dog is good, you can reward it with your voice or give it a treat through the muzzle. Mainly give your dog attention when it is wearing the Trixie Muzzle, as it needs to learn that wearing the muzzle is OK and can even be fun. When you take the muzzle off, you no longer need to reward your dog. Otherwise, the dog can get the impression that the fun starts when the muzzle comes off. At the moment there is no requirement to muzzle your dog in the UK. However, a list of breeds has been composed that includes dogs that are not allowed at all in the UK. These breeds include the Pit Bull Terrier, Japanse Tosa, Dogo Argentino and the Fila Brasileiro. People that own one of these breeds could see them being taken away by the police or the local council dog warden. Dogs that match many of the characteristics of one of the aforementioned breeds, may also be a banned type. Please consult this list of banned dogs for more information. Germany: In some countries there is a requirement to muzzle your dog (for specific breeds). Spain: In Spain, "potentially dangerous dogs" must be leashed at all times and are also required to wear a muzzle. Italy: In public places, dogs are required to be leashed and muzzled. Austria: Dogs must be on a leash and muzzles are required on public transport. Switzerland: In various places in Switzerland there may be rules on muzzles. Please contact your holiday accommodation or veterinary service for further information. Croatia: Doberman, Rottweiler, Mastiff, German and Belgian Shepherd, American Staffordshire Terrier, Bull Terrier, Japanese fighting dogs, Large Japanese Spitz, Sarplaninac and crosses of these breeds must be leashed and muzzled in public spaces. Hungary: Here you need to carry a leash and muzzle at all times. Denmark: A number of breeds are not permitted in this country, including American Bulldogs, Boerboels, Pit Bull Terriers, Tosa Inu, American Staffordshire Terrier, Kangal, Central-Asian Ovtcharka, Caucasian Ovtcharka, Sarplaninac, Tornjak, Fila Brasileiro and Dogo Argentino. If these breeds have been purchased before the 17th of March 2010, they are allowed to stay in Denmark, but must be leashed and wear a closed muzzle. You must be able to prove that the dog was purchased before this date. If your dog looks like one of the above breeds, you must also be able to prove that it doesn't belong to these breeds. The Netherlands: At the moment there is no requirement to muzzle your dog in the Netherlands, but it can be used as a measure after a biting incident. Authorities in the Netherlands are trying to reduce biting incidents by creating a list of high risk dogs. Owners of these breeds will need to attend a dog training course in future. However, it's not only these dog breeds that cause biting incidents. Many biting incidents are caused by other dog breeds, often in a home situation. That is why the LICG has set up a site where people can get more information about understanding dog behaviour, training a dog and what to do when a biting incident has taken place. 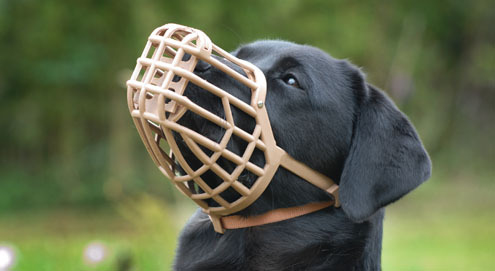 Comfortable, durable & lightweight muzzle for dogs. Help! My cat pees in the house! Now what?